The Gallery of West Bohemia in Pilsen operates in three buildings situated in the centre of the city. 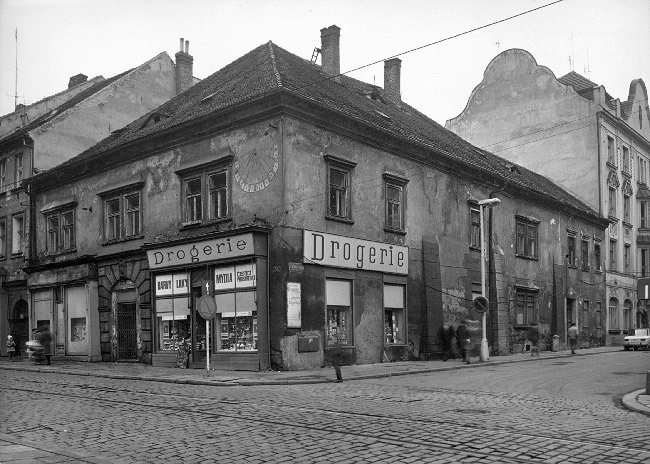 The buildings can be found at 13/83, 16/86, and 18/353 in Pražská Street, forming an important part of the urban conservation area. Originally a Gothic building, the house on the corner of Pražská and Perlová streets later underwent a Renaissance rearrangement. A major reconstruction was then done during the Classicist period. The earliest history of the building is represented by its two-storey cellar and a rare, late Gothic ceiling on the ground floor, decorated with a floral design. The entrance portal and the vaults of the main hall are evidence of the Renaissance reconstruction done sometime before 1607, when the building was reconstructed, supposedly by Jan Dragin, a mason of Italian descent. Around 1614, the owner of the house is said to be Antonín (Anton) de Stazio, an Italian builder active in Pilsen from 1602 to 1631. He probably came from the family of Giovanni de Stazio († 1595), one of the first members of the Italian community in Pilsen and the builder of the Pilsen Town Hall. At the beginning of the 18th century, the building was extended with the rear east wing. At the end of the Classicist period, in the 19th century, the lateral entrance from Perlová Street was made, and a staircase was built into the former passageway. Extant records say that the entrance hall was adjusted to the needs of shops which were run there during the 20th century. The ground floor had been used for such purposes until the early 1980s. Then, the building was closed because of its serious disrepair. In 1989, a general reconstruction of the building commenced according to the project of architect Jaroslav Soukup to adapt the building into a gallery. Although the extensive adjustments respected some of the essential features of the building, this quite aggressive alteration changed the spatial arrangement and the appearance of the house. The shape of the roof was altered and disproportioned dormers were added to it. The 19th century adaptations were removed, which changed the spatial arrangement and the look of the building. The character of the yard was damaged by the removal of the back porch. Some unique features were preserved and renovated – specifically the late-Gothic timber ceiling with its decorative paintings on the ground floor, the sundial on the frontage of the building, the Gothic jambs, and the Renaissance portal. In 1997, the renovated building was handed over to the Gallery of West Bohemia in Pilsen. The building hosted the administration of the Gallery and its library. On the ground floor, an exhibition hall for short-term exhibitions was opened. The lecture room, situated on the third floor, was used for various cultural events. In 2009, a reconstruction of the exhibition hall and the auditorium took place according to the design of architects Roman Koucký and Šárka Malá. The existing space, which proved unsuitable for the purposes of exhibitions, was replaced by the concept of a gallery with a cosy, private atmosphere, which was expressed in the design in an aesthetically convincing way. 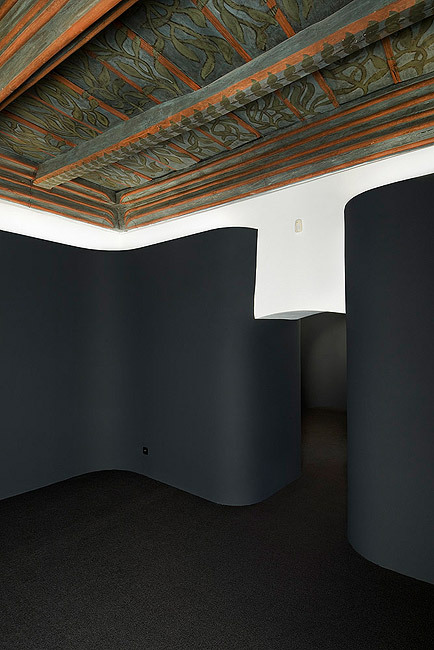 The layout of the auditorium was reintegrated and simplified to form a bright, modern space in place of the former pseudo-historicizing interior. 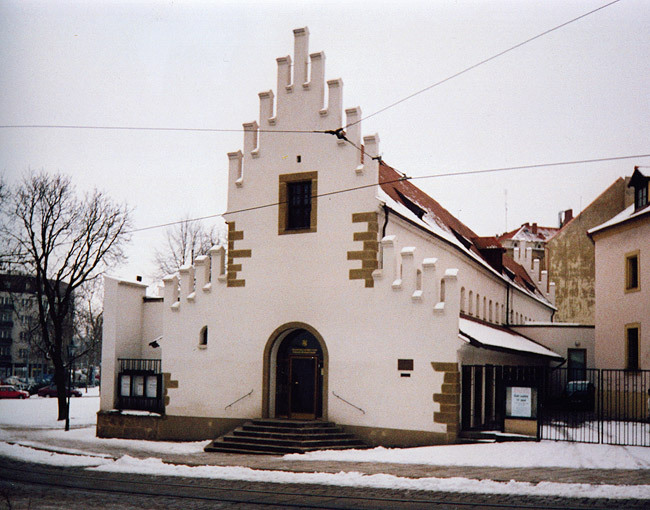 This originally Gothic one-storey house with two trapezoid gables was situated on an important transport link by the erstwhile Prague Gate, close to where the original city walls once were. Its present appearance is the result of Renaissance, Baroque, and later Classicist reconstructions. The Gothic period can be seen in the cellars, a part of its perimeter wall and the torso of the profiled jambs of the portal in its front wall. After the Renaissance adjustments, the appearance of the building was altered by the Baroque reconstruction. The entrance portal is dated to 1720. In its spandrels, there are relief figures of lions holding axes (the emblem of the butchers’ guild, a reference to the owners of the house in the years 1668–1750). During the second half of the 18th century, the rear tract was added to the building, and about a century later the yard wing was added. At the beginning of the 20th century, tearing the house down was considered, and it even appeared “in advance” in Zmizelá Plzeň (Pilsen Disappeared) publication, issued in 1917. In the end, it was the only building mentioned in the publication that still exists. The house also served as a residential building. 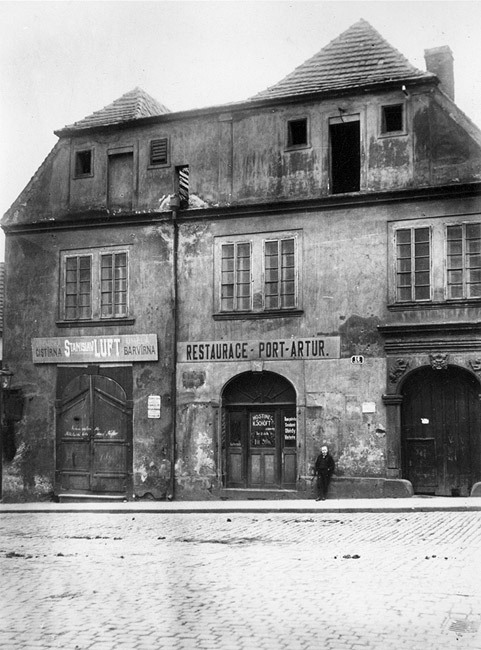 On the ground floor, there were shops and, until 1918, there was the “Port Arthur” restaurant. Between 1918, when the building was in a very poor state according to period records, and its reconstruction at the beginning of the 1970s, casual necessary repair work and adjustments due to its continuous usage of the ground floor of the house as a shop were done. By the 1960s, the house had fallen into serious disrepair. In connection with a decision from 1965 to adapt the neighbouring building of the meat market for the purposes of an exhibition hall of the Gallery of West Bohemia in Pilsen, the option of using the house as a service building for the Gallery came into question. The residents were moved away and, in 1967, a study of the reconstruction was prepared at the State Institute for Historical Town and Building Reconstruction in Prague (Státní ústav pro rekonstrukci památkových měst a objektů v Praze) after a design by architect František Matějovič. The reconstruction preserved the overall character of the building, as well as some valuable parts. Its valuable half-timbered gables were repaired, the joining gable facing the street was removed, and the torso of the building’s Gothic portal was found and exposed. In the yard, a fountain designed by Jiří Švengsbír was installed. Some of the Gallery’s departments were moved into the reconstructed building in 1975, and later the administration of the institution was eventually moved there (until then, it had been located in the buildings of the Museum of West Bohemia). Presently, the Gallery’s depository and conservation workshop are located in the building. 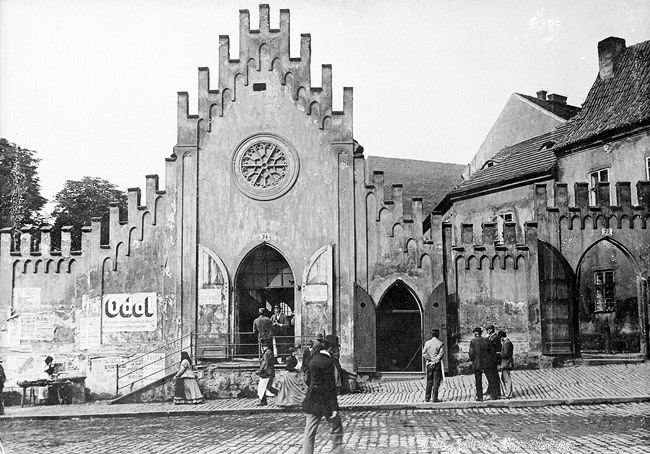 The building of the medieval meat market was built in 1392 at the place of the former city-wall bailey. Nowadays, its frontage with picturesque crenelation forms a characteristic dominant feature of the lower part of Pražská Street and Křižíkovy sady gardens. One of the few surviving buildings of this type, it kept its oblong shape and some parts of the masonry from the Gothic period. The Neo-Gothic reconstruction in 1856 created a basilical silhouette by raising the central part (the lateral naves were, in fact, formed by individual shops, adjoined along the longitudinal dimension of the building). At the main entrance on the eastern side, a wall structured in the Neo-Gothic manner with a gate was built. The façade was complemented with a rosette, moulding and slim, elongated crenelation. The building served its original purpose as a market place until at least World War II, and later it was used as a warehouse. However, it was continuously falling into disrepair, therefore after the war, the idea of pulling it down appeared. In 1962, a demolition decree was issued. The building was saved in 1965 by the decision to use the building as an exhibition hall of the Gallery of West Bohemia in Pilsen. The following year, architect František Matějovič from the State Institute for Historical Town and Building Reconstruction in Prague prepared the reconstruction project. Construction site surveys and construction management was provided by the Regional Centre for National Heritage and Environmental Protection (nowadays Národní památkový ústav, ú. o. p. v Plzni, National Heritage Institute, Pilsen Regional Office). The reconstruction took place from 1967 to 1971, and in March, 1972, a new exhibition hall for the Gallery of West Bohemia in Pilsen Masné krámy opened there. It was unique within the Czech Republic in terms of layout and interior arrangement. In the spirit of the approach of the period, the concept of space counted on its multi-functional use for cultural programmes, which resulted in designing the central nave as a chamber concert hall. The manner in which the reconstruction was done, typical for the late 1960s, respected historical designs and details, but at the same time removed the Neo-Gothic 19th century reconstruction, which was not considered valuable then. The Gothic appearance of the frontage was adjusted in purist spirit; of all the articulated and decorative features, only the picturesque crenelation of the gables was maintained. The building was complemented with the construction of the lateral naves illuminated by skylight. The transversal interior walls, once separating the former shops from the central space, were replaced with glass vistas serving as display cases. The reconstruction as a whole represented a sophisticated and architecturally accomplished project. In the 1990s, an adjustment took place which partially interfered with the original solution. In 2009, interior adjustments were carried out according to the design of architect Roman Koucký (parallel with the adjustment of “The 13” Exhibition Hall), which unified the space from the perspective of the visitor by accentuating the symmetrical triple-nave layout, and emphasized its light character through the concept of a “grand white gallery” in contrast to the “intimate black gallery” of “The 13”. In the area of a former cloakroom, the gallery shop was placed. Masné krámy Exhibition Hall also hosts cultural programmes, among which regular Sunday music matinées have become a tradition. Casual socials also take place there, along with wedding ceremonies.